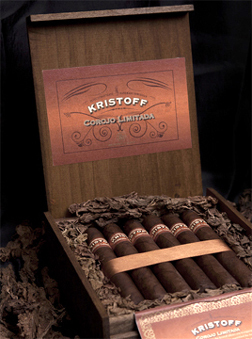 If you are a fan of Nicaraguan cigars, Kristoff's Corojo Limitada cigars should be on your "to smoke" list. This medium- to full-bodied cigar is nearly a Nicaraguan puro made with 100% Habano seed tobacco that has been double and triple fermented. The wrapper is Nicaraguan Corojo Habano, the filler is Nicaraguan and Dominican Habano, and the binder is Nicaraguan Habano. Maintaining Kristoff's tradition of flavorful, smooth cigars, the Corojo Limitada is filled with spice, nutmeg, and toasted nut, and offers a sweet/spicy finish. These cigars are nestled in loose tobacco inside the unusual rough-cut cedar box now synonymous with the Kristoff brand. Rated 93 and ranked No. 11 in Cigar Aficionado's Best 25 Cigars of 2012!